Two rooms are better than one, when there’s a few of you, it must be done. It is safe to say that no one likes sharing a room with a person who has a snoring problem. 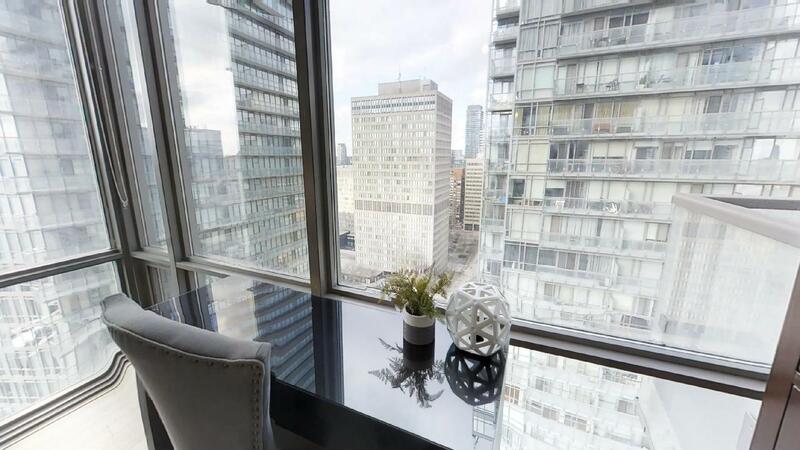 Toronto serviced apartments can take away the pain and get you in a two bedroom furnished apartment. 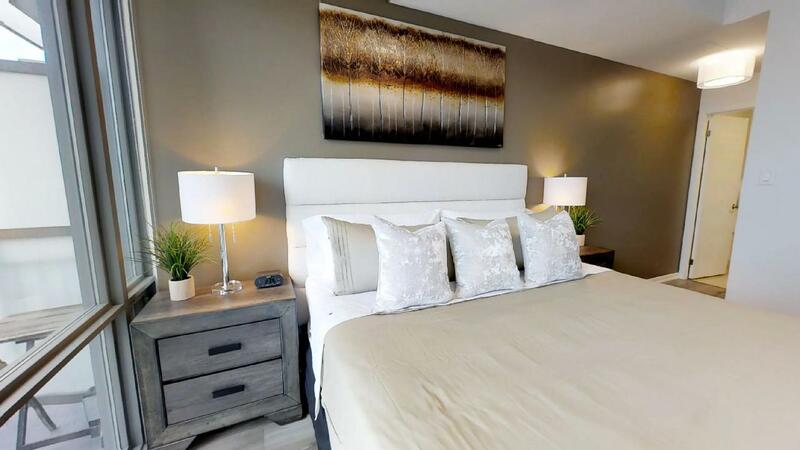 Set your eyes on this contemporarily modern two bedroom suite, it is approximately 750 square feet and consists of Italian style finishes in the bathrooms and kitchen. Each bedroom has a queen-sized bed that is dressed with the finest linens, a load of closet space and a desk workspace. Additionally, each bedroom can have its own full bathroom, since there are 2 available for added convenience. 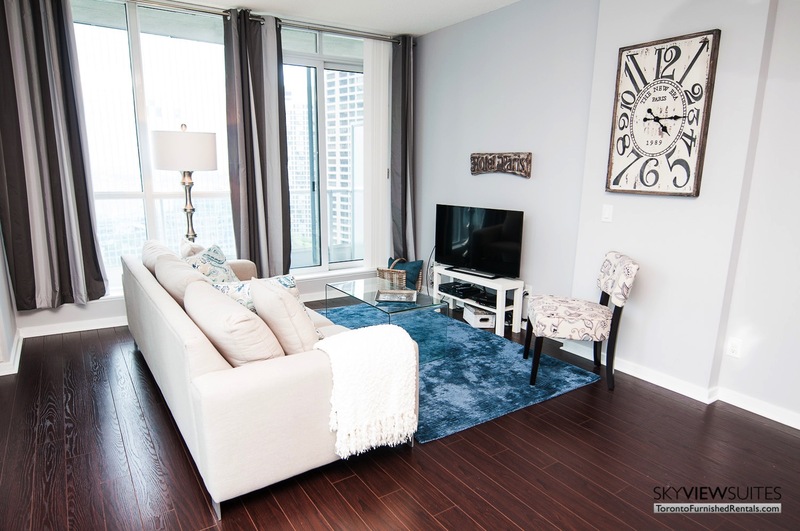 Beautiful floor to ceiling windows brighten up the condo and the hardwood floors in the suite are gleaming, creating a charming space to stay in. There is a dining room with relaxing seating for four that flows into the living room. With a cozy couch and flat screen TV, it becomes easy to let loose and unwind. The kitchen is fully equipped with everything you need to carry on with your daily routine. From stemware to cutlery, it’s all there, not to mention, the stainless steel appliances. Murano Luxury Condos is a graceful architectural wonder inspired by the famous glassworks of Italy. Centered in the cultural and business engines that drive Toronto such as the financial district and fashion exchange, the Murano provides expediency for any kind of stay, whether it is business or leisure. The location is perfect since it is only a tiny little 10 minute walk away from your shopping needs at the Eaton Centre or a city event at Dundas Square. There is also the added luxury of nearby grocery stores at College Park, local restaurants, bars and shops along Yonge St. And it’s a short walking distance from hospitals on University Avenue. Of course, staying at a hotel does sometimes have perks, like access to the amenities (if any). However, when you stay at a Toronto serviced apartment, you get the right to use all of the elegant amenities that they have. Take for example the extras that are included at the Murano: there is a soothing indoor swimming pool with Whirlpool and retractable roof section so the sun rays can shine down on your skin, kissing it to a tan. Also, there is a scenic outdoor area which is landscaped just adjacent to pool area. And finally, there is an entertaining multifunctional indoor recreation room and a third floor outdoor landscaped area with lounging areas and a walking/running track. 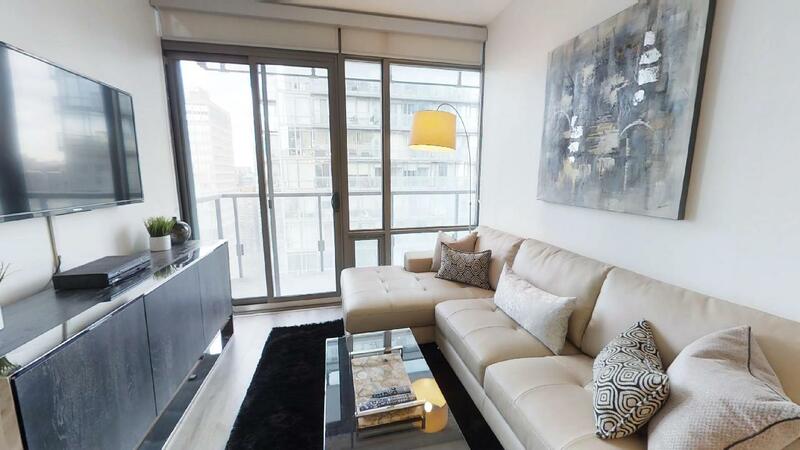 To make your Toronto accommodations at this unit, or to check out all our other available spaces, click here: Furnished Rentals.